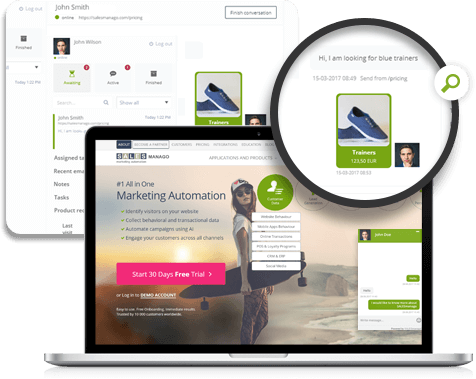 The one and only Live Chat designed especially for eCommerce & Online Stores. Do not just talk but start actually selling via Live Chat. Live Chats have become extremely popular in the recent time. But all of them provide basic ways of communication between the company and the customer. 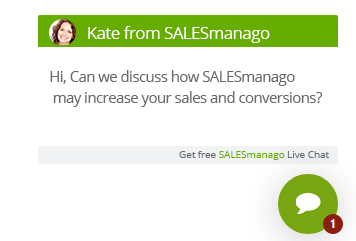 SALESmanago Live Chat can be easily used in this basic context but we added to our app specific features that take this communication to the next level which is reinforced by the other features of SALESmanago platform. Complete Behavioral and Transactional profile of the customer available to the consultant during the chat – imagine how much it can add to valuable conversation with the customer if the consultant can see in real time not just the contact data of the contact but additionally the information about the history of the purchases of the customer, which pages on your website were clicked, scoring, segmentation. Ready made personalized product recommendations available to be sent during the conversation by the consultant with one click – from now on your consultant may not just talk but actually sell the products during the conversation thanks to a variety of possible product recommendations that appear during the conversation. The recommendations are based on our AI & Machine Learning Algorithms, last viewed and purchased products. Progressive Profiling of the customer during Live Chat sessions to get more valuable knowledge about the customer – you will be gradually learning more about potential clients without putting them off by the amount of information they are asked to provide. More form fields can decrese lead conversions, but with the dynamic contact forms you will collect only the data which you don’t have about the contact yet. Automatic conversations and sales led by SALESmanago Sales Bot for faster customer service and saving time of the consultants – within our chat the customer may immediately get the standard information about your business or get product recommendations without actually using consultants time. It’s available thanks to the deployment in our Live Chat our Intelligent Sales Bot integrated additionally with Facebook Messenger. Fast and easy search of products the customer is asking for and delivering them by the consultant in real time during the conversation – save your customer’s and consultant’s time by letting our eCommerce Bot do all the work. It will look through your product catalogue, find the best products that match contacts interests and automatically display them on the chat window. Automatic deployment of multichannel marketing automation strategies in other channels (e-mail, website, mobile, ad networks) depending on what’s happening during the chat – thanks to the fact that our Live Chat is an integral part of the whole marketing automation platform, you can use the information obtained during the chat to automatically trigger other marketing actions in other channels for example the system will segment your customers, send emails with other recommended products, display web push messages, send text messages with discount codes or if the customer is not ready yet to buy, launch lead nurturing programs. Take care of customer satisfaction and uninterrupted customer journey through the data analysis offered by Live Chat analytics – the panel consists of detailed data concerning the pace of taking up the conversation, time of response, overall duration of conversation and URL addresses where customers ask questions the most frequently. Get to know their opinions after finishing the conversation. All of this will help you with evaluating work of your consultants and the customer satisfaction rate. If you want to generate new leads, use the module to analyse how many of the newly acquired contacts you have gained through Live Chat on your website. Setting up the Live Chat is extremely easy thanks to our Live Chat wizard and takes a couple of minutes.